The Reptile House at Huber Woods Park is closed for renovation. The Huber Woods Environmental Center helps visitors experience and develop relationships with the natural world through exhibits and displays. Come explore its hands-on exhibit areas. While there, play Native American instruments while viewing and listening to recordings of American Indian musicians and dancers. 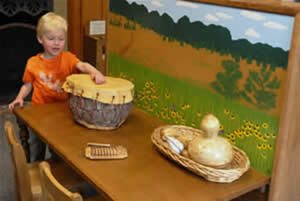 Try basket weaving, archeology, the revolving maize game and many other Lenape activities. 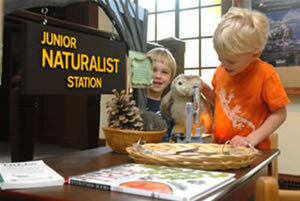 Discover something new in the environment at the Junior Naturalist station. Watch tadpoles and frogs frolic in the Forest Room. View the many colorful native birds outside or play in the puppet theater. Live turtles and snakes await your visit to the Reptile House. Huber Woods Park also features an all-access Discovery Path, wooded trails and a beautiful picnic area with a view of the meadows and Navesink River. The Environmental Center and the Reptile House are open weekdays from 10 a.m. to 4 p.m., and on weekends from 10 a.m. to 5 p.m. Explore Huber Woods with your family and friends! Each backpack contains all you need to make your self-guided nature walk filled with adventure and exploration! Pick a backpack for Pre-K, Forest, or Meadow. Use of the backpack is free but you must leave your valid NJ drivers license with the docent. Stop by our docent desk and pick up a special Tree Challenge backpack. Each bag contains a trail map, guides, and instruments to help you learn about the beautiful trees that make up Huber Woods. Work with your new tools and become a naturalist for the day as you learn different ways to identify and survey the local flora. Return again at different times of the year to see how the environment has changed. Turn in your observations so you can help our scientists record the data. Garden State Parkway to Exit 109. Southbound, turn left onto Rt. 520. Take jughandle for Half Mile Rd; northbound, go straight at exit. Follow Half Mile Rd. to end. Turn right at traffic light onto East Front St. Follow East Front St. to Hubbard Ave. Turn left onto Hubbard Ave. and follow (.6 mile) to Navesink River Rd. Turn right onto Navesink River Rd. and continue 3.2 miles. Turn left onto Brown's Dock Rd. Park entrance is at top of hill. State Hwy. 35 to Navesink River Rd. (north of Cooper Avenue Bridge, Red Bank.) Northbound, turn right. Southbound, use jughandle to make left turn. Travel east on Navesink River Rd. (2.8 miles) to Brown's Dock Rd. Turn left onto Brown's Dock Rd. 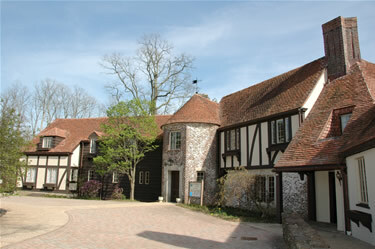 The park entrance is at the top of the hill.